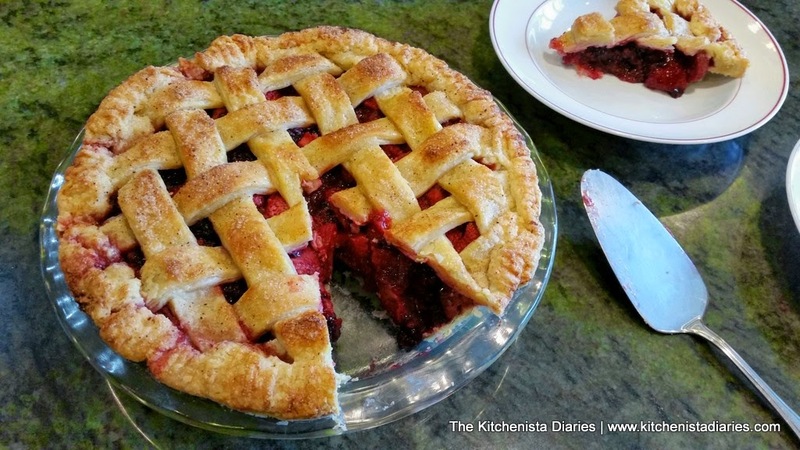 Yes, it's the last day (hour) of summer, and yes I'm up late at night posting a summer berry pie recipe. I'm definitely sliding this one under the teacher's door at the end of the semester and hoping it still counts for credit! But honestly, this pie is too good to wait until next year to make it. Depending on where you live, you probably still have plenty of fresh berries readily available...so don't be mad. Just rejoice in the last few days of warm weather we have and enjoy some of your favorite summer recipes a little longer. 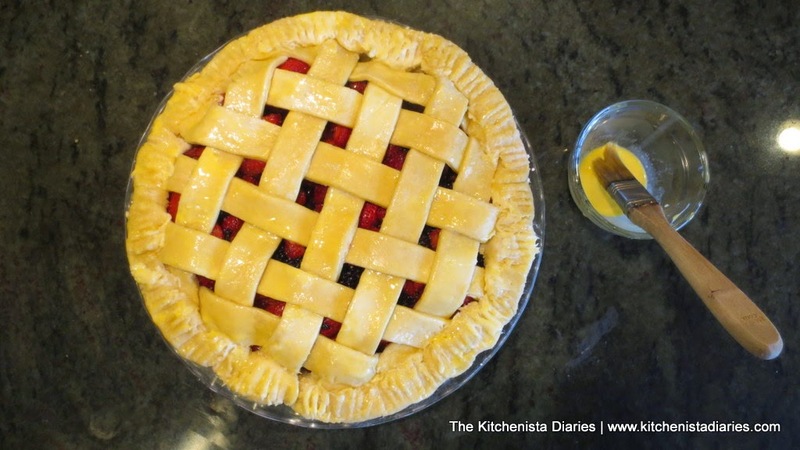 You simply cannot end the season without baking a berry pie. I spent all summer testing pie recipes. Literally, all summer. It was glorious, and my waistline is paying for it (so much for shedding those baby pounds, huh?) Angela did that, so you wouldn't have to. 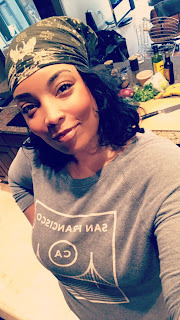 Anyway, awhile back I shared Part One of this adventure which was my tutorial and recipe for a delicious handmade pie crust. If you really want to max out on the wow factor with this pie, you'll want to start there. It's a great thick, buttery, flaky crust which is large enough to fit deep dish pie plates and really holds up to all the filling you're about to make here. 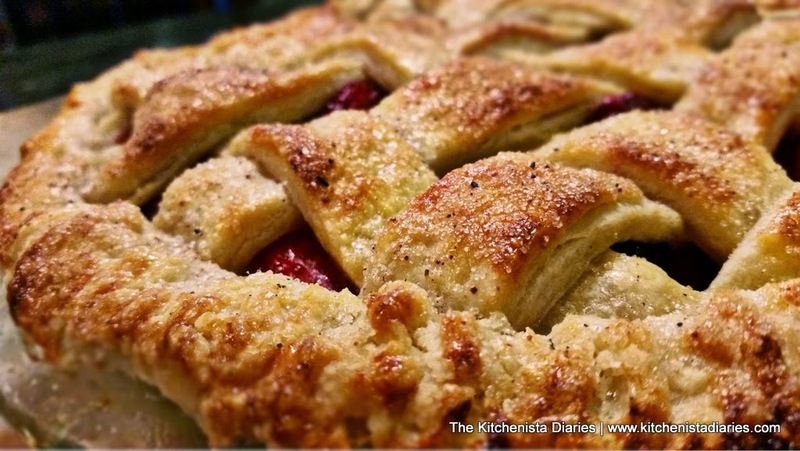 If you have your own perfect pie crust, go for it...just please make your own. All I ask. If you're gonna make a pie, make a pie. (Most) people don't eat pies but on special occasions, so it's really one of those desserts that you should strive to knock out of the park with unforgettable deliciousness. 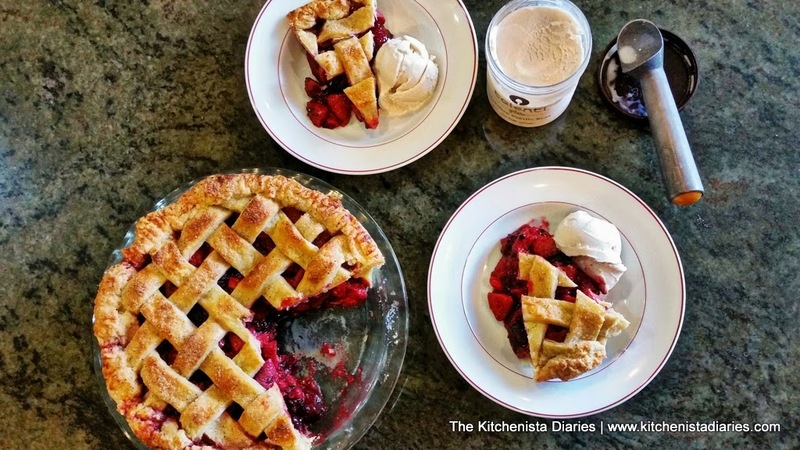 This Balsamic Strawberry & Blackberry Pie is memorable. I made it three times, and each time the last bite was eaten I immediately wanted to make another one. In the midst of testing pie crust recipes, I was baking so many pies that I was sending my son next door to the neighbor's with entire pie halves. It pained me to share this one. I know, that's selfish of me. But the luscious, sweet strawberry and blackberry filling laced with tangy balsamic vinegar was so good that I just wanted to sit in front of the refrigerator and eat it straight from the pie plate with my bare hands. With the exception of a good apple pie, I never understood the hype about fruit pies until this summer. Blueberries, peaches, cherries, nectarines, raspberries, strawberries...they all got put into pies. This one was by far my favorite and I think when you make it you'll totally understand. So here's the thing about pies. You kind of just need to commit to spending the day making one, between the pie crust and the actual making of the pie, and the baking of the pie, and the waiting for the pie to cool... If you want to save yourself a little bit of a headache, make the crust the night before and just leave it in the fridge. It'll actually be easier to work with and the flavor is a bit better with time too. I was making pies so much that I got in the habit of always having a couple pie crust rounds in my freezer so I'm never really in a time crunch for that part. It's best to start a pie in the morning for a couple reasons. 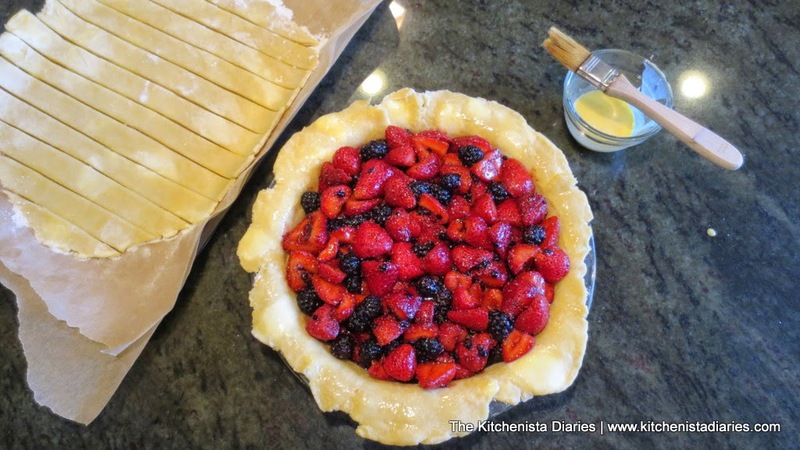 One, if you're baking in the summer your kitchen will become warmer as the day goes on which makes working with homemade pie crust dough tricky. 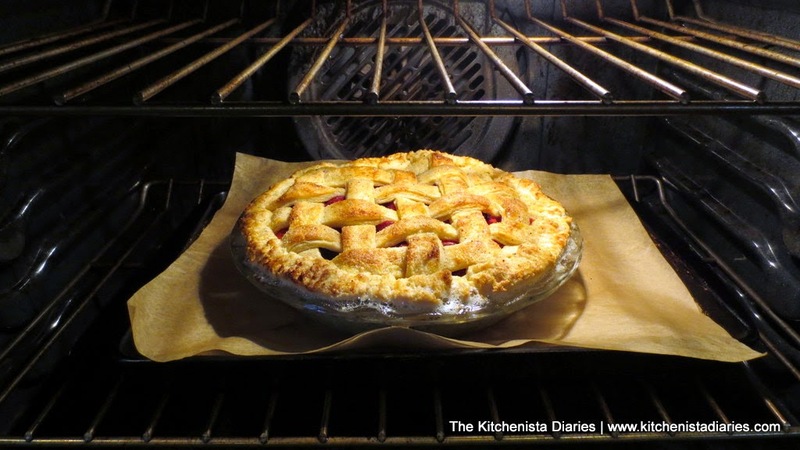 Especially if you're doing any kind of decorative top crust, like the lattice work shown here, when you need the dough to stay as cool as possible. 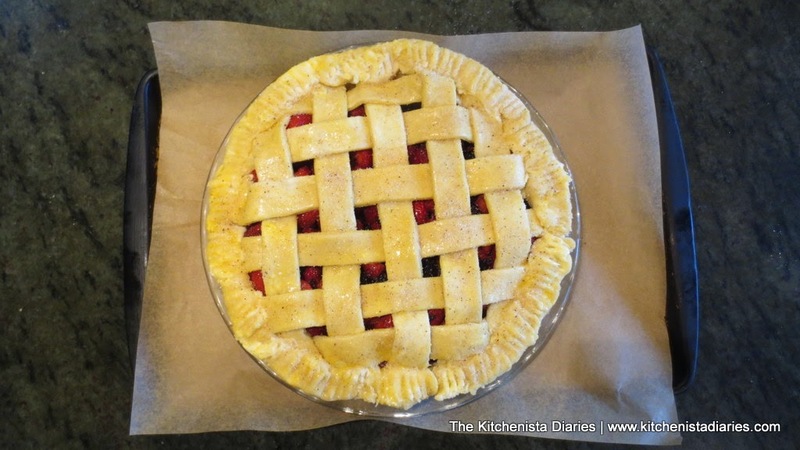 Secondly, you need at least 3 hours for the pie to cool before cutting into it. The filling and tapioca thickener really needs a chance to set up properly so you don't have berry soup when you take out your first slice. For those reasons, I try to start baking by 10 a.m. or so, and have my pies into the oven no later than noon. That is more than enough time to have pies that are ready to be served after dinner. Ready to make some pie? After slicing your strawberries, rinse them along with the blackberries in a large colander and shake away any excess water. I don't always make a point of emphasizing organic vs. non-organic in most of my recipes, but this is one of those that I will say the couple extra bucks pays off. The pies I made with organic strawberries were noticeably more flavorful and tasted more like...strawberry. I know, that's weird, but sometimes these GMO fruits and veggies really just don't taste like anything to me. You'll also probably notice that the organic strawberries are a little smaller, which makes them perfect little nuggets for this pie. 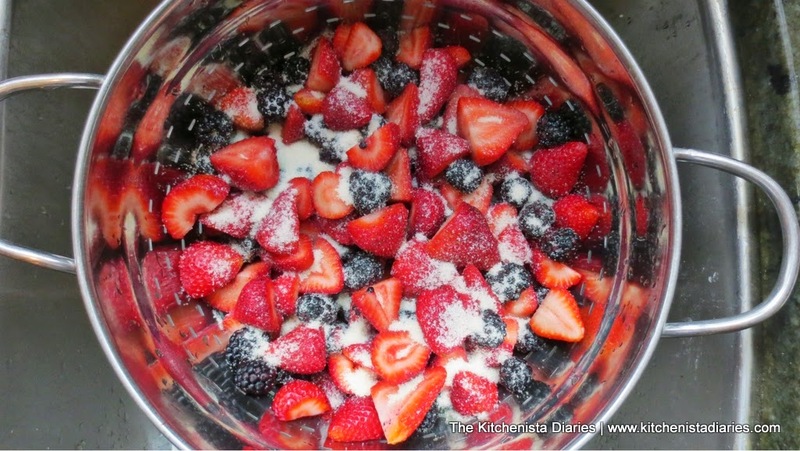 Toss the berries with half of the white granulated sugar (1/4 cup) and a good pinch of salt. 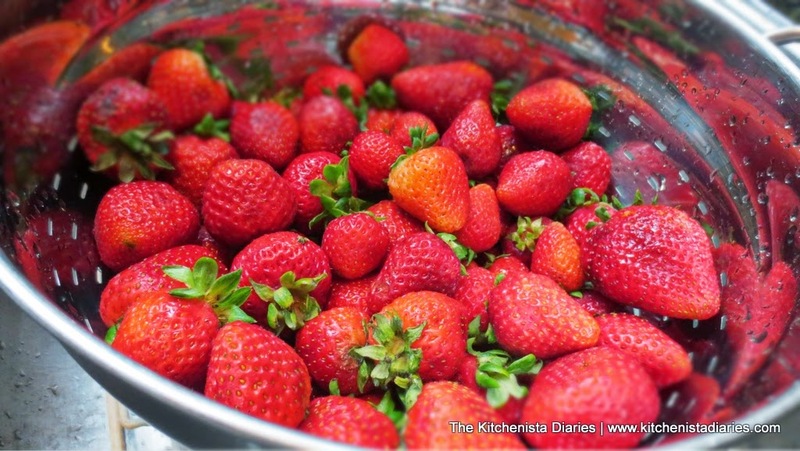 Set the colander in your sink or on top of a larger bowl so that the juices can drain as the berries macerate. 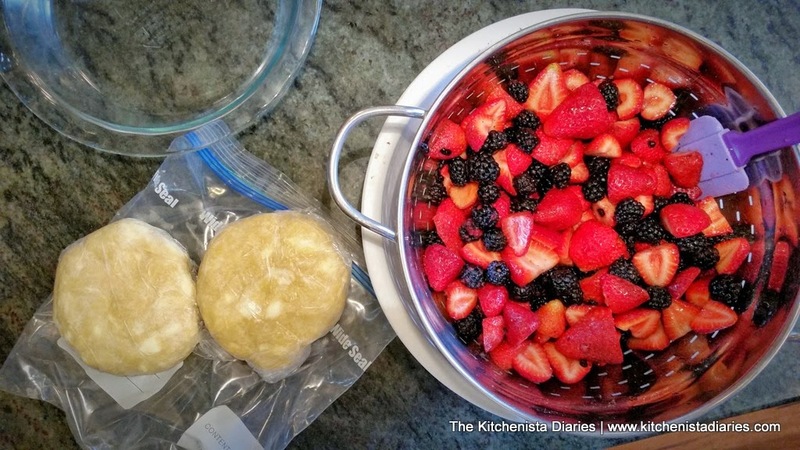 You want to let that drain at least 20 minutes or up to an hour for best results, stirring the berries occasionally to allow them to drain better. You'll be surprised with how much liquid is released. I actually saved the berry juices to make a great vinaigrette! Meanwhile, now is a good time to roll out your pie dough. Take it out of the fridge and let it rest on the counter for a few minutes to take the chill off before you attempt to roll it out. 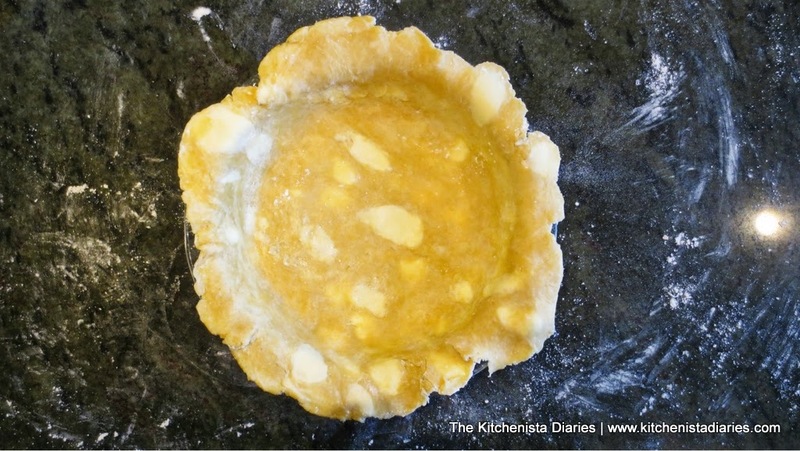 The first pie dough round that you'll roll out will be for the bottom crust. I'd keep the second one in the fridge until just before I need it, otherwise it'll get too soft by the time you try to roll it out. 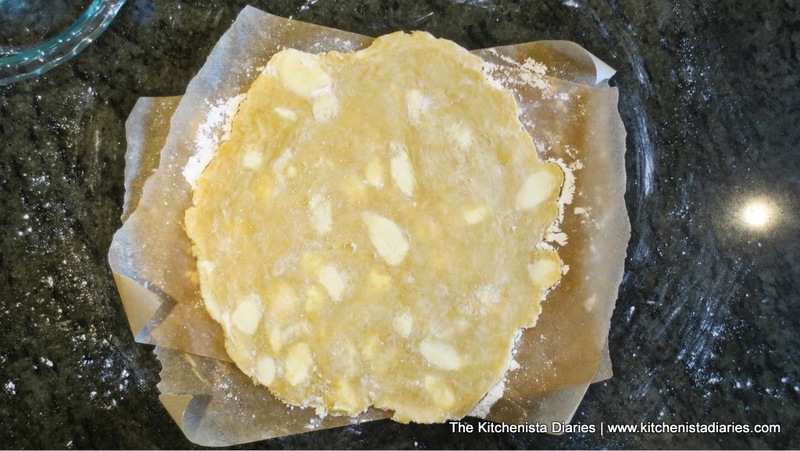 I'm still not quite an expert at this part, but for me it works best to roll out the dough between 2 sheets of floured parchment paper until it's about half the size I need. Then I remove the top sheet and finish rolling the dough out to fit the size of my pie plate. I found that it needed a little less flour this way to prevent sticking. As I get better at baking I've gradually been updating my equipment. I think a new rolling pin might be next...this one has been around in my mom's kitchen since my childhood! Roll from the center towards the outer edge of the pie dough, then lift the dough up (use your dough scraper) and make a quarter turn. Roll again from the center towards the outer edge, and turn again. 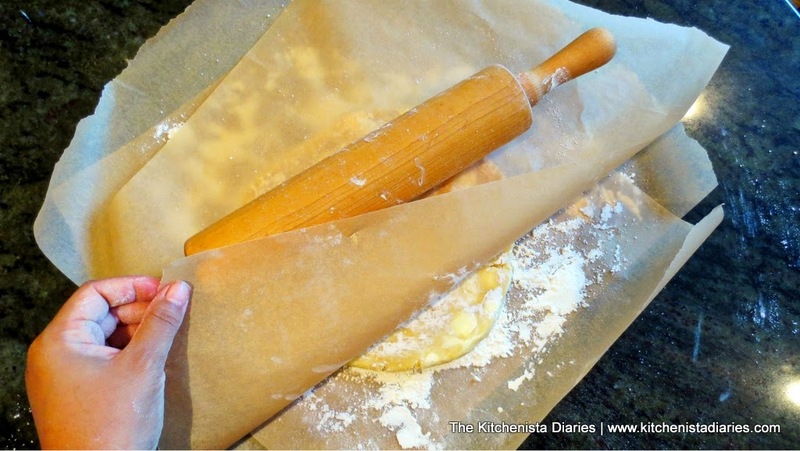 This way you are not rolling over the same spot over and over again, and the dough won't be stuck to the surface when you try to transfer it to your pie plate. If you need a little more of a visual, check out this great clip from Fine Cooking: How to Roll Out a Pie Crust. You'll notice I have visible spots of butter in my pie crust. If you made your own crust, you probably do too! That's a great sign of buttery flakiness soon to come and an important reason to keep your pie dough cold so that the butter doesn't melt. If you've noticed that your pie dough is already starting to get super soft and tearing easily, you might want to slide it on to a baking sheet and freeze for a few minutes to harden the butter back up. This is another reason why it's handy to work on parchment paper. Once your crust is rolled out to about 12" or so (it should be a couple inches wider than the diameter of your pie plate rim,) transfer it to the pie plate. Make sure the pie crust is pressed firmly against bottom and sides of the pie plate, trim any overhang that's more than an inch, and transfer the pie plate to the freezer to stay chilled until it's needed later. The second pie dough round will become the top crust. This part is up to you whether you'd like to leave it whole and fully cover your pie, or do something decorative. I really love seeing the vibrant colors of the berries so I wanted the lattice top. It's pretty much the way I do most of my double crust pies; I just really love that classic look. Maybe this holiday season I'll switch things up and look for something new and creative to try! I'll give you a rundown of how I do my latticework later, but for now just roll out your crust as we did above. 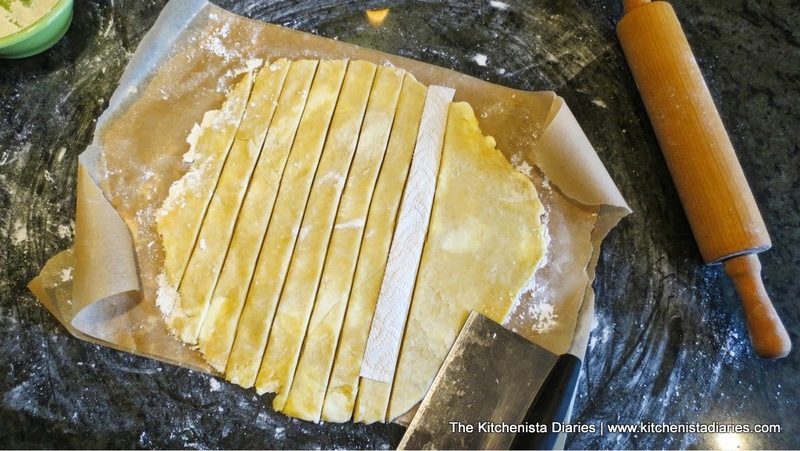 If you're doing a lattice top, you can slice the crust now into evenly spaced strips. I don't have any fancy tools for this - I just cut a strip of paper towel about and inch wide and use that as my guide so the strips are all the same size. I use my dough scraper or a sharp knife to slice the dough. Usually I'll aim for 8 to 10 strips. The wider you cut the strips, the less intricate the latticework will be. Once the dough is rolled out, and sliced, slide it onto a baking sheet. (Do you see how important that parchment paper is becoming?) 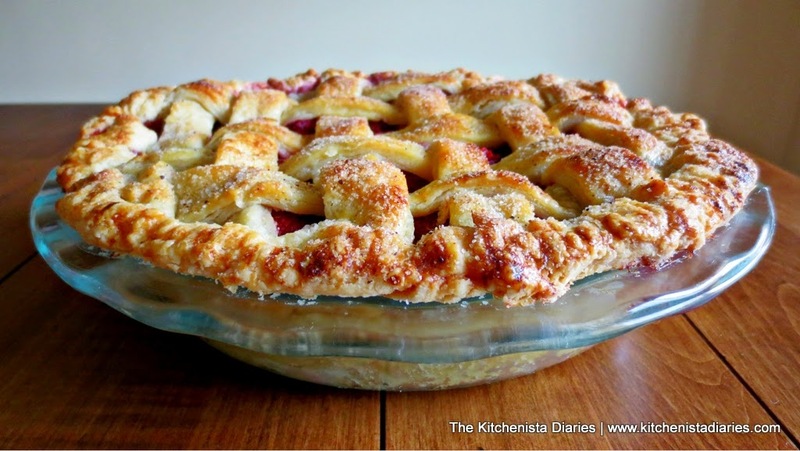 Transfer it to the freezer to chill -- lattice tops can be really difficult to pull off if the pie crust starts melting on you. You want the dough to be cold but still pliable. If you haven't done so already, grind up your tapioca until it is about as coarse as white sugar. A small coffee grinder has becoming an indispensable tool in my kitchen. I use it for everything from grinding spices to nuts, to these tapioca pearls. 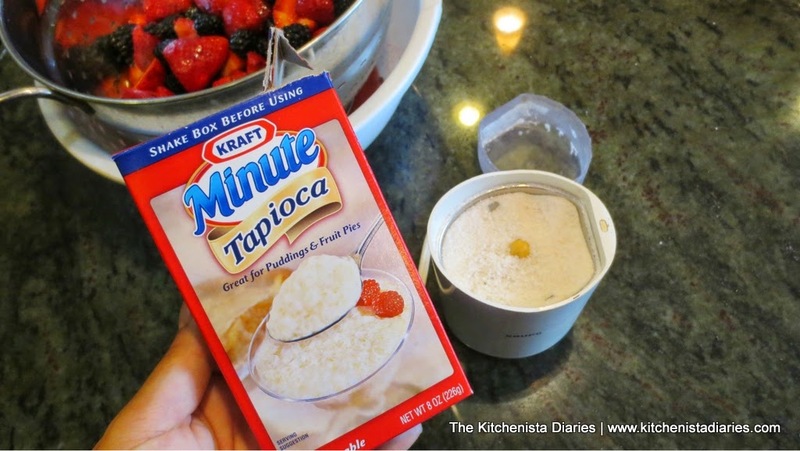 Tapioca is a thickener that works really well for berry pies. The little pearls soak up all that berry juice in somewhat of a suspension, and the result is a very clear, thick sauce without an aftertaste. In my opinion, it works much better than cornstarch or flour, which can become pasty and cloudy in pies. Berry pies are notoriously tricky to thicken up and I spent a good part of my summer playing around with different starches. I think the most interesting of which was kuzu root, which I used to thicken a blueberry pie, but since I had already successfully tested this recipe with tapioca I decided to leave well alone this time. Back to these berries, which by now have probably released at least a half cup or so of juices. 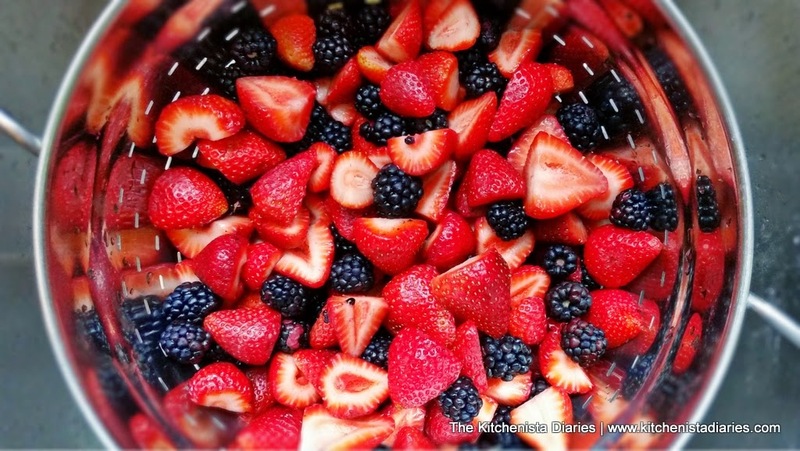 Discard or save the juice that drained and transfer the berries into a large mixing bowl. I like to taste a couple to get a sense of how sweet they are so I know if I need to adjust the amount of sugar in my recipe at all. 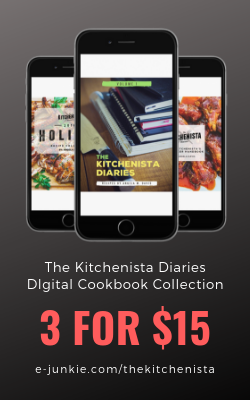 Every now and then you might find that you need a little more or a little less than a recipe calls for, so just be aware and always cook to your tastes. 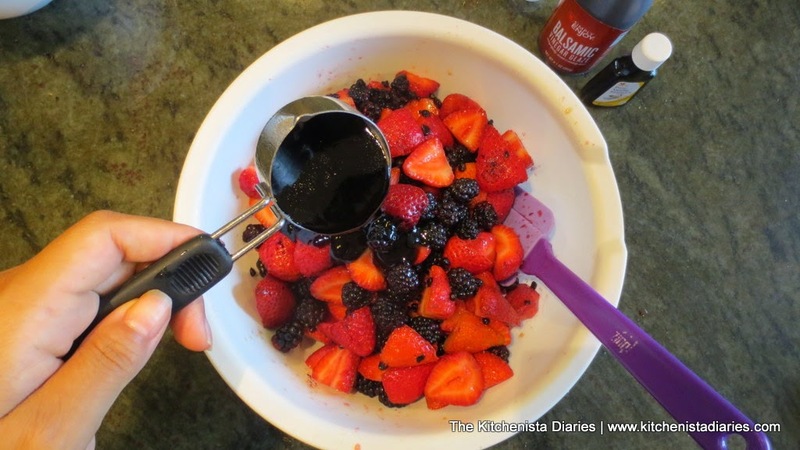 Toss the berries with the vanilla extract and balsamic glaze. Balsamic glaze is simply a reduction made from balsamic vinegar that can be bought in stores, or made at home. It's thick and sweet, and I found it to work a lot better in my pies than using straight vinegar. It might sound strange to put vinegar in a pie, but balsamic vinegar and strawberries are a classic combination. If you're skeptical, just try a couple tablespoons the first time instead of going all in. I promise you'll fall in love. In a small separate bowl, mix the brown sugar with the remaining white sugar, cinnamon, salt, and ground tapioca. 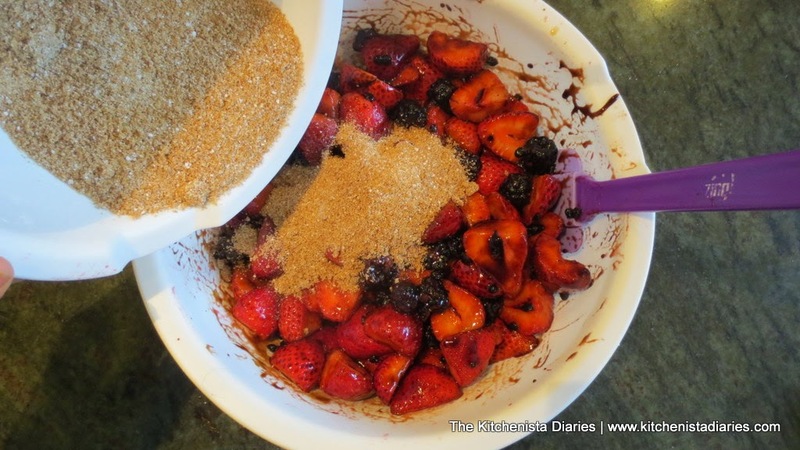 Fold the sugar mixture into the berries and toss to evenly distribute. Preheat your oven to 425° F and arrange a rack in the lower third of the oven. Transfer the berries into your pie plate, using a slotted spoon so that any excess juice is drained back into the bowl. You should have about 8 cups of filling here which is more than enough to pile into a standard deep dish pie plate. Of course, feel free to scale this recipe down a bit if you're using a regular sized pie plate. Now it's time for the fun part. Okay, I might have a different idea of "fun" than most but I promise making a lattice pie crust isn't nearly as difficult as it looks. First I like to get my egg wash ready. This is just a mixture of the egg yolk plus a couple teaspoons of water and a pinch of salt. Whisk it together and you're done. Use a small pastry brush to very lightly paint a little egg wash around the edges of the pie crust, this just helps the top stick a bit. I like to use a traditional pastry brush with natural bristles because it's a bit softer against the dough than the newer silicone brushes are. Now, for the lattice. Instead of tripling the size of this post, I created a table below which shows my steps to creating the weaved design of the lattice crust. 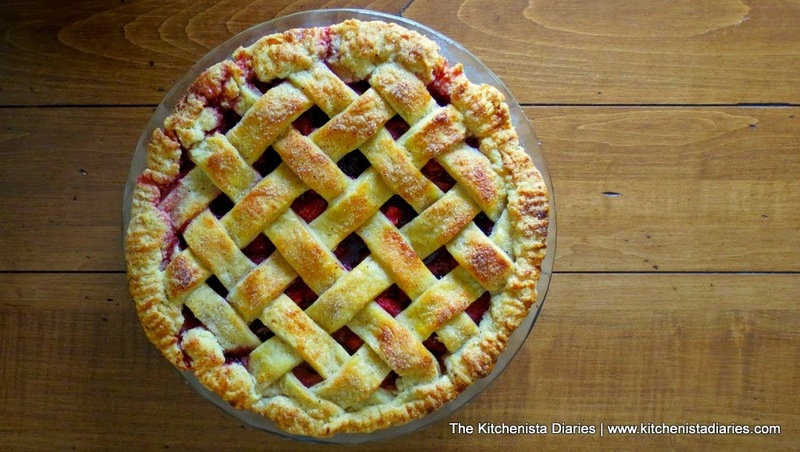 For the sake of not reinventing the wheel, I'm going to also point you in the direction of The Kitchn's tutorial on How to Make a Lattice Pie Crust, where they've made a beautiful slide show already with step by step instructions! 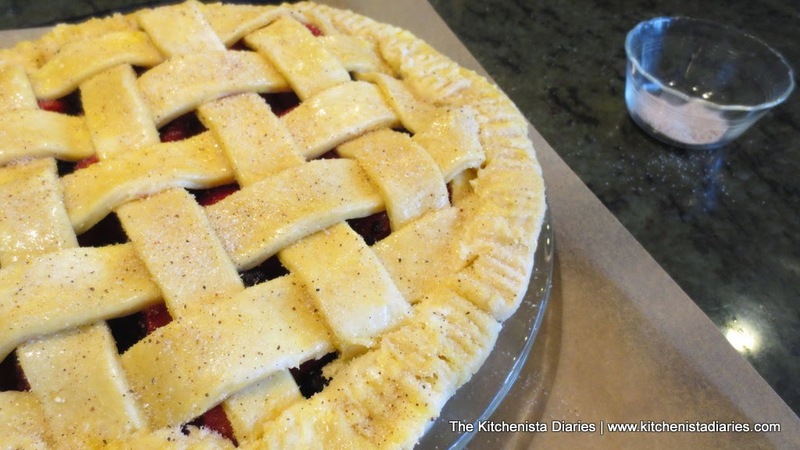 Once your lattice crust is placed, you'll simply work around the rim tucking the edges of the strips under and creating a seal with the bottom crust. 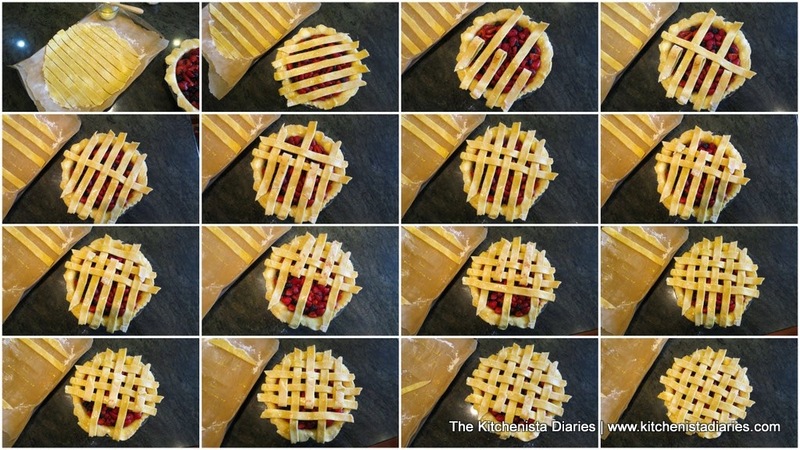 Depending on how much of an overhang you have, you may be able to roll it up into a thick border and flute the edges, or simply use fork tines to press the top and bottom together around the edge of the pie crust. Whatever floats your boat. This crust is so thick that it will puff up a bit when baking so don't spend too much time on ornate details. Often by this point my pie crust is really starting to soften up so I'll move it to the freezer for a few minutes before finishing up. Once your top crust is sealed, use your pastry brush to apply the egg wash all over, being careful not to drip too much in between the lattice strips. In the photo below is an example of the other way I seal my crust edges using fork tines, when I have a little less of an overhang. For the final touch, I like to sprinkle my pie crust with a bit of raw sugar that's mixed with freshly grated nutmeg. This is entirely optional but I like the sparkly finish it gives the crust and the hint of nutmeg is perfect with berries. 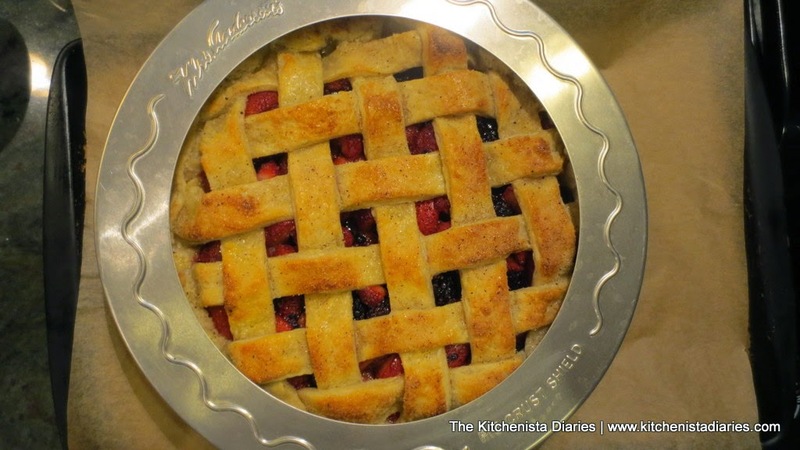 Transfer your pie plate onto a heavy baking sheet or stoneware. Either will work to not only support your pie as you move it in and out of the oven, but ensure even cooking to crisp up the bottom of your pie crust. A sheet of parchment paper placed underneath makes easy cleanup for inevitable spills as pie filling bubbles over. By now your oven should be nice and hot, preheated to 425° F. The initial burst of heat helps to create those flaky layers in the crust and help with the initial browning. 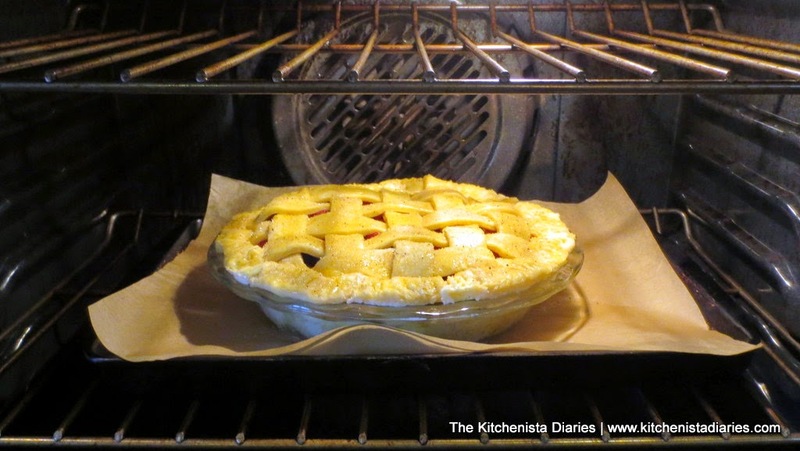 I bake my large pies like this towards the bottom of the oven so that the top crust doesn't brown too quickly. After 20 minutes, you'll see that the crust has already started to puff up significantly and you may even be able to see the separation into layers in the lattice strips. Turn your oven down to 350° F.
At this point I almost always will use a pie shield to protect the rim of my crust from browning too fast. It's just a thin aluminum round that you place over top of your pie so that the center is still exposed to the heat. You can create something similar with aluminum foil, but if you're going to bake pies often this is one of those tools you'll really find helpful. You'll notice I took the entire pie out of the oven here. Ovens lose a ton of heat when you open and close them. It's better and safer to remove the entire baking sheet, close the oven door, and then arrange your pie shield (especially if you're creating one with foil.) Once you're done just pop it back in the oven. By the way, you should do the same thing when roasting meats if you need to stop and baste often. 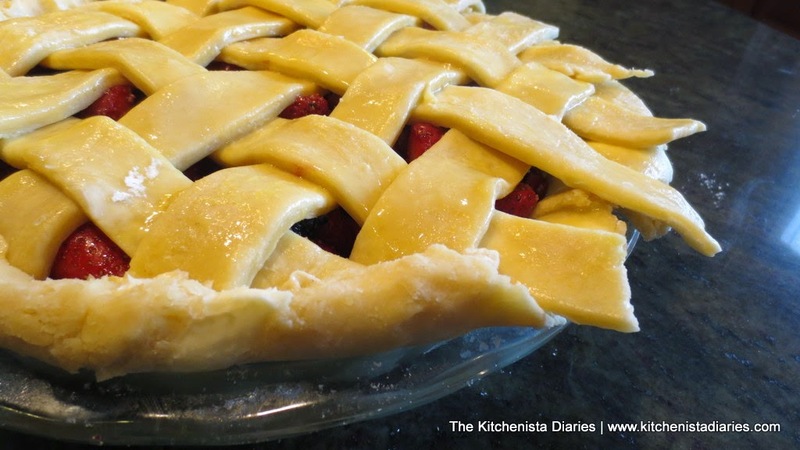 The pie will need approximately 40 minutes to finish baking at 350° F. The berry filling should be bubbly, crust golden brown, and the bottom and sides of the crust should also be golden. Glass pie plates are great for this reason so you can monitor progress. When the pie comes out of the oven, remove it from the baking sheet and set it out on a wire rack to cool at room temperature for at least three hours. Don't cheat! Remember that scene in the movie Life when Martin Lawrence's character stole the "whites only pie" sitting out on the window sill? Yeah, I totally get it now. 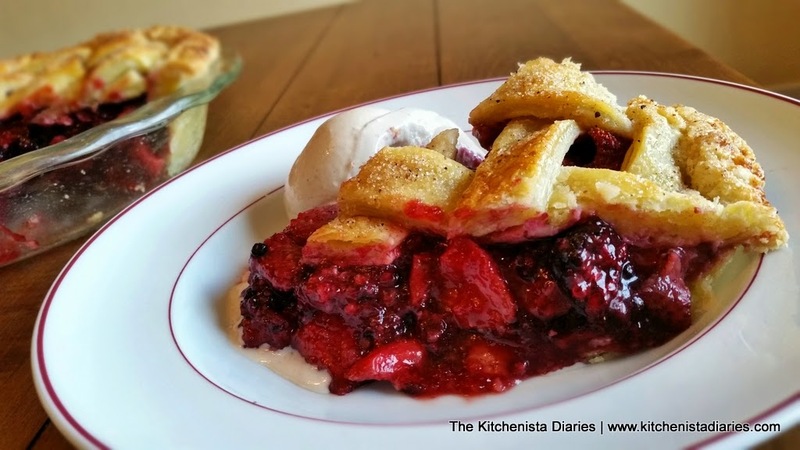 You can enjoy this Balsamic Strawberry & Blackberry Pie at room temperature or warm, with ice cream of course. Vanilla bean gelato really compliments the flavors here...the combination is divine. Cutting into a pie is always a moment of anxiety to me - will the filling hold up? Did the crust cook through all the way? I swear, no matter how many pies I've made I'm still deathly afraid of the end result. 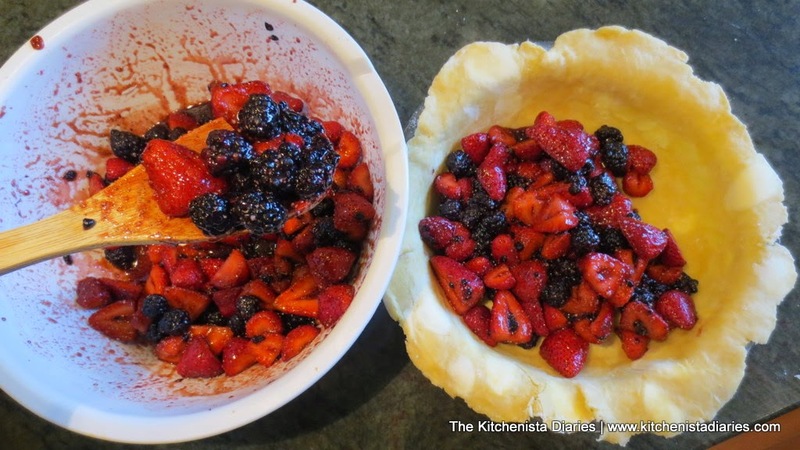 Berry pies are fickle, no matter what thickener you use you are bound to just run into trouble once in awhile with a pie that's a little saucier than you'd like. I can honestly say this has happened only once for me using tapioca but I think it was my fault for not letting it cool first! What I love about this filling is that it holds up just enough to have some bite to it, but still has plenty of that delicious syrupy berry sauce making it simply irresistible. My favorite way to enjoy this pie? Cold. Straight from the fridge.